Packaging Details Height Width Depth Weight 1.6" 6.6" 6.25" 15.92 oz. Details All natural. High fiber. Gluten free. Low sodium. Low glycemic. Only 190 calories!! Gluten free. The all natural midget bar takes portion control to new heights. following a good nutrition plan means paying attention to the calories you eat. 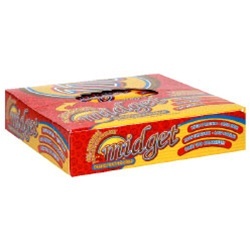 At only 190 calories, the Midget makes that easy to achieve. Reaching new heights in portion control! Nutrition Facts Serving Size 1 bar Servings Per Container 8 Amount Per Serving % Daily Value Calories 190 Calories from Fat 100 Total Fat 11 g 17% Saturated Fat 4 g 18% Cholesterol 0 mg 0% Sodium 40 mg 2% Total Carbohydrate 19 g 6% Dietary Fiber 3 g 12% Sugars 11 g Protein 14 g Vitamin A 0% Vitamin C 0% Calcium 4% Iron 40% Magnesium 8% Niacin 15% Phosphorus 10% Zinc 6% Thiamin 8% Trans Fat 0 g Gluten Free *percent Daily Values are based on a 2,000 calorie diet. Ingredients: Dry Roasted Peanuts, Peanuts Coating [Sugar, Partially Hydrogenated Palm Kernel Oil, Partially Defatted Peanut Flour, Nonfat Dry Milk, Whey, Peanut Butter (Peanuts, Hydrogenated Cottonseed Oil), Salt, Soy Lecithin], Soy Crisps (Soy Protein Isolate, Tapioca Starch, Salt), Corn Syrup, Sesame Seeds, Peanut Flour, Glycerin, Evaporated Cane Juice, Gum Arabic, Peanut Oil, Water, Natural Flavors, Salt, Soy Lecithin. *These statements have not been evaluated by the Food and Drug Administration. This product is not intended to diagnose, treat, cure or prevent any disease.